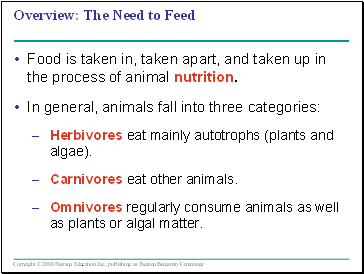 Food is taken in, taken apart, and taken up in the process of animal nutrition. Herbivores eat mainly autotrophs (plants and algae). Omnivores regularly consume animals as well as plants or algal matter. 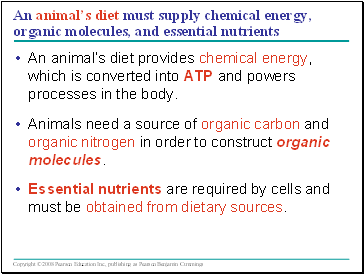 An animal’s diet provides chemical energy, which is converted into ATP and powers processes in the body. Animals need a source of organic carbon and organic nitrogen in order to construct organic molecules. 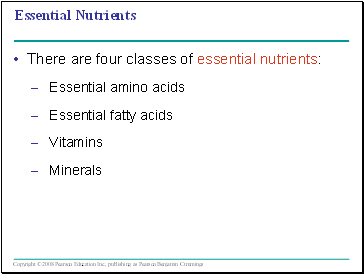 Essential nutrients are required by cells and must be obtained from dietary sources. 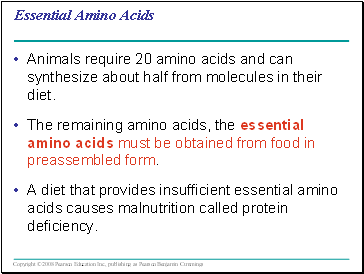 Animals require 20 amino acids and can synthesize about half from molecules in their diet. The remaining amino acids, the essential amino acids must be obtained from food in preassembled form. A diet that provides insufficient essential amino acids causes malnutrition called protein deficiency. Meat, eggs, and cheese provide all the essential amino acids and are thus “complete” proteins. 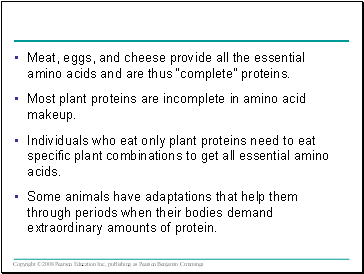 Most plant proteins are incomplete in amino acid makeup. 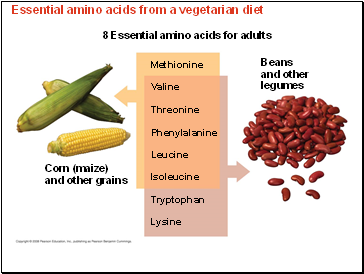 Individuals who eat only plant proteins need to eat specific plant combinations to get all essential amino acids. Some animals have adaptations that help them through periods when their bodies demand extraordinary amounts of protein. 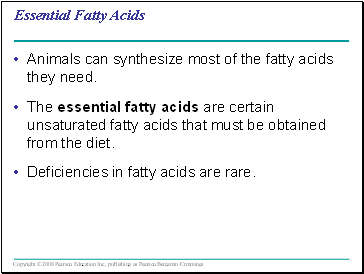 Animals can synthesize most of the fatty acids they need. The essential fatty acids are certain unsaturated fatty acids that must be obtained from the diet. Deficiencies in fatty acids are rare. Vitamins are organic molecules required in the diet in small amounts. 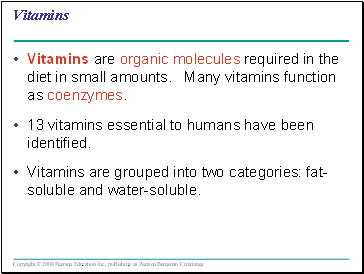 Many vitamins function as coenzymes.